The Prokofiev violin concertos have been staples of the repertory for years. This is not surprising as they represent the composer at his best: lovely tunes, piquant harmonies, dancing rhythms and plenty of variety. The first was composed around the same time as the Classical Symphony and the second just before the Romeo and Juliet ballet. 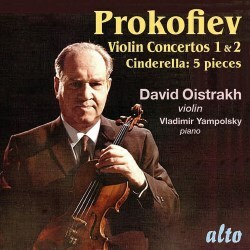 David Oistrakh was too young to give the premieres of either but they became staples of his repertory as well. They offer many opportunities for him to display his characteristic virtues: a lovely sweet tone, always a pleasure to listen to, exact intonation and precision in observing Prokofiev’s vigorous rhythms and a capacity for magic which is quite indescribable. This stereo version of the first concerto with Kondrashin was considered by RB (review) to be greatly inferior to an earlier mono one with von Matacic because he considered that in this one ‘his tone and that of the orchestra is compromised by a tart and vinegary nasal quality’. I am not sure which transfer that was, but I can say that for this one Paul Arden-Taylor must have worked wonders in re-mastering it, because none of that comes across here. Oistrakh is as imaginative as ever, the lovely passage in the first movement with flute, harp and muted strings is magical, and the whole sounds like a recent recording rather than one scrubbed up from 1962. This is a different performance from the one with the same forces issued as part of a large compilation on Brilliant Classics (review). The second concerto is the celebrated performance under Galliera which has long been admired and which also sounds splendid in this transfer. Oistrakh’s trills and runs are superbly poised and in the clod-hopping final movement he manages to be both elegant and lumpish at the same time. I don’t know whether the recording, from an EMI original, needed as much work in re-mastering as the first concerto, but it sounds similarly good and also well matched, which considering the entirely different provenances of the two recordings, presumably Moscow and London respectively, is quite an achievement. As a bonus we have Five pieces from Cinderella. Prokofiev transcribed a number of items from this ballet for piano, and five of them were then re-transcribed by Mikhail Fichtenholz for violin and piano, which is what we have here. They should not be confused with the Five Melodies Op 35b. The five pieces, with their original numbers in the ballet, are Grand Waltz (30), Winter Fairy (16), Gavotte (10), Passepied (21) and Mazurka (28). I have to say that Oistrakh’s playing here, while very accomplished, strikes me as rather routine. The recording too seems close and airless compared to that for the two concertos. On the other hand this work is a rarity. There are several other Oistrakh performances of the two concertos available, and it is not always clear from on-line catalogues which they are. So I should point out that neither performance here is the same as on the similar coupling on the Great Recordings of the Century disc reviewed by RB. The Five pieces are also available in, presumably, the same performance on a Vanguard compilation. The notes here are terse but adequate. Newcomers to these lovely concertos will presumably turn first to a more recent recording, but those who savour great violin playing will be glad to have these performances in such good transfers.